Mark thee calendars, Socrates. 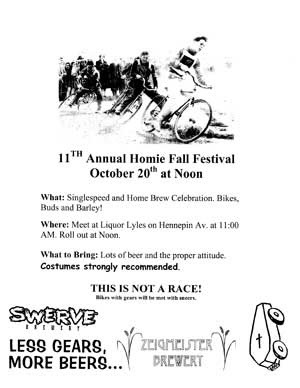 The 2007 Homie Fall Fest is heading your way, 20 October. Followed on the 21st by the Mark Rahn Invitational CX Race at Powderhorn Park. Sure to be a hoot. 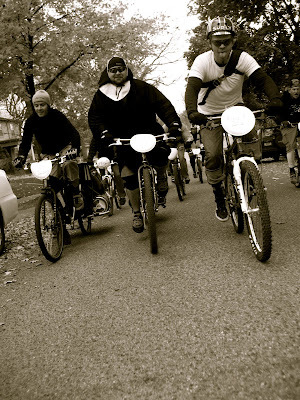 And since we're on the (hot) topic, the Boom Islanc CX Race is the week prior, 14 October. Due to all this hot cross racin' action, CRC Coffee Bar & Ye Olde Cykel Garage will be closed on those there two Sundays. To reiterate. Clozed October 14 & 21. To race cross. And act a fool.